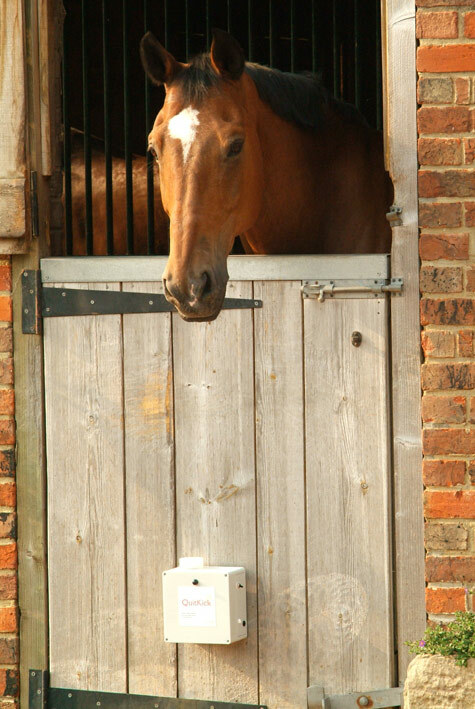 Your QuitKick is designed specifically to stop horses from kicking stable doors. Do not attempt to use it for anything else. The unit must always be located OUTSIDE the stable where the horse cannot touch it. Ensure the horse is not in the stable whilst fitting and familiarising yourself with the QuitKick. Unscrew the water reservoir cap and fill with clean tap water. Replace the cap. After approximately 10 seconds simulate a kick to the stable door. DO NOT stand over the unit whilst doing this or you will get a face full of water! You may need to activate the unit a few times to draw the water from the reservoir. The direction of the water jets can be adjusted by gently inserting a pin into the jet holes and adjusting as required.